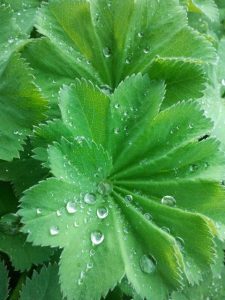 The name alchemilla derives from the Arabic word alkemelych meaning alchemy. This plant was a favourite of the medieval alchemists. It is thought that due to its excellent healing powers the alchemists considered it magical. During their search for the Philosopher’s Stone, the magical way of turning baser metals into gold, they collected the pearly drops that form and sparkle on the leaves of ladies mantle and called the water “water from heaven”. The dew drops are actually exuded from the plant itself and were thought to extract subtle healing and magical virtues from the leaf and were used in many alchemists potions. For healing the plant has always had a strong affinity for women and the female reproductive system. Culpepper said it was ruled by Venus. Tannins, bitter principle, a glycoside and salicylic acid. Traces of essential oil.